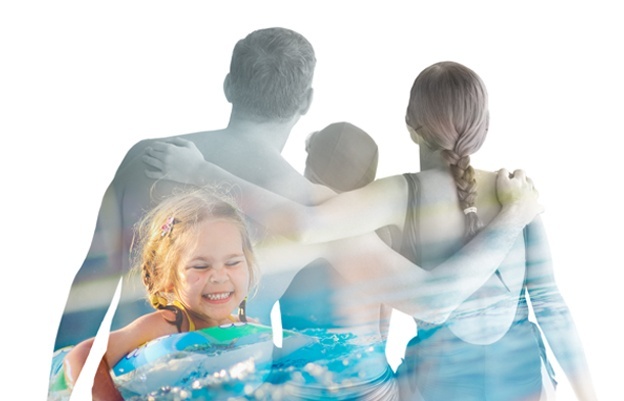 Clear Comfort's chlorine-free and low chlorine residential pool solutions take the swimming and pool ownership experiences to the next level. This patented LifeGuard Techonology provides you with a new way of treating your pool water without the harmful effects of toxic chemicals. 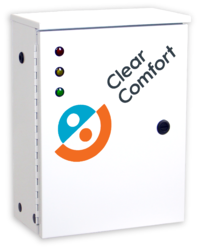 Clear Comfort provides safe, superior disinfection beyond UV, ozone and salt chlorine generators. 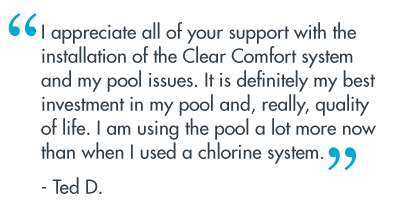 By reducing your chlorine use with Clear Comfort you will simplifly pool maintenence, reduce chemical irritation, eliminate harmful disinfection byproducts, save natural resources and much more. Inspired by the same natural process that makes our air clean and breathable, Clear Comfort uses a two stage advanced oxidation process to safely and effectively clean the water. Lifeguard Technology can eliminate or reduce harmful disinfection byproducts created through the interaction of organic matter with pool chlorine. Third-party studies have characterized disinfection byproducts (DPBs) as carcinogenic and linked them to eye and skin irritation, allergic reactions, asthma, and other health issues. 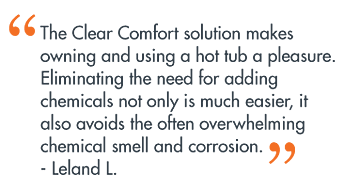 The first stage of disinfection creates powerful and fact acting hydroxyl radicals that destory the toughtest contaminants on contact. Hydroxyl radicals — more effectively than chlorine, UV, ozone or salt — eliminate bacteria, virsuses and protozan cysts. In addition, hydroxyls destroy chlorine resistant microorganisms like Cryptosporidium, a recreational water illness. In the second step, the Clear Comfort system produces a safe level of hydrogen peroxide that is passed into the pool for continuous residual sanitation. Hydrogen peroxide is commonly used for water treatment and exceeds the standards of safety and efficacy to offer residual sanitation. Unlike chlorine and other typical pool chemicals, hydrogen peroxide does not produce any harmful disinfection byproducts. © Clear Comfort Water 2012 - 2017. All Rights Reserved.